It certainly was the toughest trek we went for, around Bangalore. A place must for the trekkers I would say. Kanakpura Road leads you outside Bangalore towards Kanakpura, obviously. At a point (I do not remember the name of the place), there is a huge street light tower. A left turn from there leads you towards Rangaswamy bitte. Any person from there can guide you towards the cliff There is a small market place on the way, where we stopped to buy water and biscuits. The place comes handy while you are returning as good bakery, tea stall etc which not only is palatable but tastes awesome after the labor of .climbing up and down the cliff. After taking direction from many a people, you reach the base of the hill and can park your vehicle there. The walk starts from here - not upwards but horizontally. The walk is around 1.5 KM long and at the end of it and crossing a trench, the base of the hill is below the feet and the tough terrain ahead. The climb starts slowly without much slope but slowly the path narrows down and the group gets into series mode., one after another. As you start going up, the journey becomes tiresome. 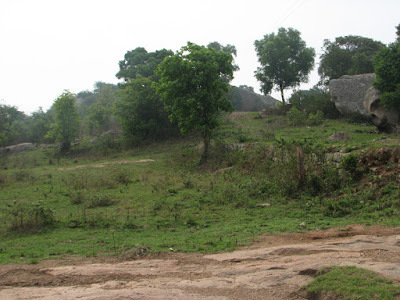 There are a many flat rocks where you can cool your heels and rejuvenate yourself for the trek ahead. This hill is quite a cheat, As you cool your heels and look ahead, the top looks to be very near. The sunlight filtered through the leaves and trees gives an impression that in another couple of minutes you would be relaxing with cool breeze giving you the feeling of elixir. But mirages are not nice things to chase, which the hill tells very promptly. However before you really loose hope, you are almost at the top and some more climb would take you there. Once at top, the feeling is as inexplicable as at any other peak. The peak is the highest in that area, giving you the feeling of being at top. The greenery in front your eyes would be mesmerizing. The skin with perspiration, being touched by the cool air and the eyes being served by the pure nature is a feeling, you never experience anywhere in the cities. As on most of the peaks, this one also boasts of a small temple and the stairs next to the temple leads you to the top of a big flat rock, giving you a nice place to rest your back on and the sleep is not far away. The journey back is even more tiresome. The problem with the downward journey is the way you need to strain your ankles to stop you form falling down. While going up, the lungs are in full throttle whereas the journey downwards works out legs muscle. On top of it the precaution you need to exercise so that you do not slip makes it more lengthy. The thing is while going up, you have the option to call it a day and stop climbing up but while climbing down, the option does not exist. I can see HP WebOS tablet as the closest follower of that next to Apple. Gov. louis vuitton uk shop very low. You also know that they have one pair of lungs. louboutin uk Create a pack of mixed nuts to go in your brown bag or take a different nut every day. Shape a square framework utilizing the floppy disks and connect them together with string or yarn. classic revival, widely diffused phase of taste (known as neoclassic) which influenced architecture and the arts in Europe and the United States during the last years of the 18th and the first half of the 19th cent. A large amount of traffic will not come overnight from your efforts. mulberry 254571 Their stores in southern California even give discounts on rainy days..